THE DEVIL WEARS PRADA have announced their return to Rise Records and their next release, a conceptual EP entitled Space, coming in summer 2015. The band's "Zombie 5 Tour Presented by Rockstar Energy Drink" celebrating the fifth anniversary of the acclaimed EP, Zombie, kicked off in Nashville this past Sunday night and and will criss-cross the country through mid May, wrapping in Bloomington, IL on May 14th. 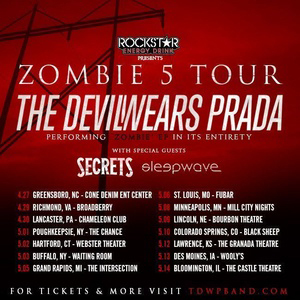 The band is performing the Zombie EP in its entirety for the first time, as well as a new song from the forthcoming Space EP, among many other fan favorites. The Space EP marks the band's first concept release since Zombie and the first on Rise Records since their sophomore release, Plagues, in 2007. Zombie debuted at #11 on the Billboard Top 200 Album Charts in the summer of 2010. For more information, please visit www.tdwpband.com, www.facebook.com/tdwp, www.twitter.com/TDWPband,www.youtube.com/TDWP, and www.riserecords.com.